As I mentioned previously, I am thinking of implementing a moderation system whereby ranked users can vote down a comment. Whenever a threshold is reached, the comment is hidden or removed. I will probably set the threshold at 5. That way, a R5 user can single-handedly kill a comment (or two R3 users). Currently, I have a script that kills comments based on keywords, but I am wary of making it too aggressive due to false positives. This will continue to run. In addition, I personally check the latest comments once or twice a day and kill any spam/useless bits. The more drastic approach is to only allow registered users to comment. I have my reservations about this because the comments section was always meant to be free-for-all so that anyone can contribute without registering. 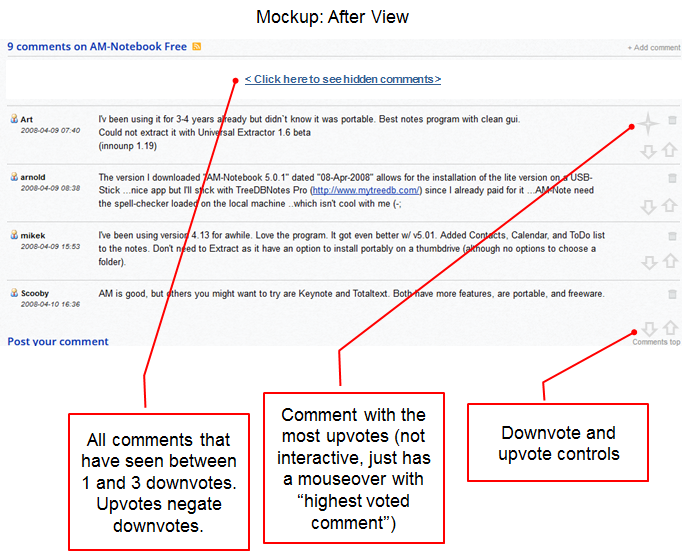 Yet another approach is to introduce a moderation system whereby comments are hidden until approved. This approach has its disadvantages due to slower turnaround so it would make conversations difficult. Plus it requires a full-time moderator, therefore I am more in favor of a post-moderation process. With regards to disabling URLs, I am not sure that's going to stop the spammers. It would be like cutting off the nose to spite the face! I think we need to strike a balance, and some amount of crap will inevitably get through that we have to deal with. guinness wrote: The only problem I can see is who is going to be assigned the arduous task of moderating the comments? Assuming whatever system comes about for evaluating and removing bad comments is easy, I'd be happy to. I wanted to mark two comments as spam the other day, but noticed there wasn't a mechanism in place to do so! Disabling URLs would actually prevent the comment spam I believe. It would also help if you properly made the links nofollow. The nofollow isn't properly being added properly at the moment. I am not too sure about that. A good percentage of spam contains no link, or links with improper formatting (hence not hyperlinked). Some even post links in the username field! Another thing is, do we really want to be held hostage by the "terrorists" in this way, much like how airport security has become? It's alright to set limits (no arbitrary HTML tags etc. ), but to push these limits all the way to inconvenience the majority? Thanks for reporting this. I have fixed it, and the nofollow tags should be in the proper format now. You could have the link in plain-text. Savvy internet users will copy and paste that link if they're interested. But, now that you've properly added the nofollow parameter, let's see what happens in the next few weeks! Quick question for Andrew: does this sub-forum have "quick post" option enabled 'cause I can't see it? @joby_toss: You're right. It isn't. I have enabled quick reply for this forum. Thanks! webfork wrote: Assuming whatever system comes about for evaluating and removing bad comments is easy, I'd be happy to. I wanted to bring up entry comments with the group again. This is important because, although I try hard to write and maintain accurate and clear entries, I know my own tendency on other sites is to look at program comments before even a program description. Those comments immediately underneath a program are often the first real impression that visitors have. Age - Many comments immediately underneath applications on the site are now over 10 years old. That's not necessarily bad since some entries are not recent (our very first entry was last updated 15 years ago), but it can be a concern. Changes - Comments refer to a program that almost doesn't exist anymore. For software that's gone through many changes during their time on the site, including completely different software core and interfaces (as is the case with programs like Firefox). Expansion/Shrinking - ShareX has expanded it's featureset dramatically since it's entry in the database and Thunderbird started out as pure email and now includes chat, tasks, and calendar. Pidgin meanwhile has lost numerous features as many chat services it supported shut down. Auto-hide all but the last 10 comments, putting them underneath a "click here for a full comments listing"
Relevance vote presenting a down-vote for no longer helpful comments. This would only be present with comments older than ~3 years and again would get comments put under a "click here for a full comments listing" group. Anyway, some ideas. Suggestions welcome. Last edited by webfork on Thu Aug 16, 2018 3:46 pm, edited 1 time in total. I think auto-hide is a good idea. I think "Pinned comments" and "Auto-hide" are all quite viable. Auto-hide will be a little easier to implement, pinned comments more work, but probably not too bad. I am wondering how the down-vote in "Relevance vote" differs from the current "trash can" function for each comment (where if enough downvote accumulates will send that comment to the ether). The trash can I pictured more for spam comments, if I remember correctly how we initially set that up. Trashing comments would be to get them off the site entirely, while less relevant comments don't show up front-and-center. So the up/down vote button goes to the first 10 comments to bump them off into the hidden list? 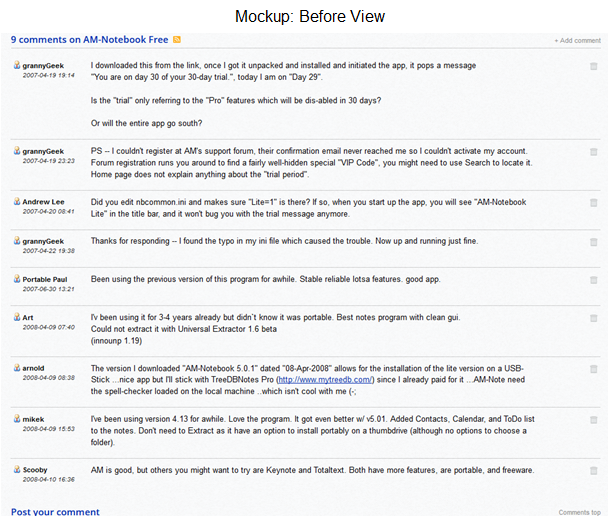 I borrowed the AM-Notebook Free entry (https://www.portablefreeware.com/index.php?id=44) because because I can fit all the comments on one image and every comment is over 10 years old. Let's say that the top 5 comments all see the minimum number of downvotes (between 1 and 3). These all become hidden. The comment from Art meanwhile gets the most upvotes, so his would show up at the top and get a small star (or similar) object next to it. I drew this up in PowerPoint so let me know if you'd like the original to make changes.